If Superman is so powerful, why doesn’t he just take complete control? What is it that prevents him and his Justice League teammates from doing exactly that? Written as a response to the proactive, morally ambiguous superheroes of Warren Ellis and Bryan Hitch’s The Authority, “A Better World” asks those questions as it looks at an alternate reality where the heroes of the Justice League have become totalitarian rulers of a crimeless world. It’s one of the show’s strongest episodes, an action-packed story that explores superhero ethics while planting story seeds that will come to fruition in Justice League Unlimited. 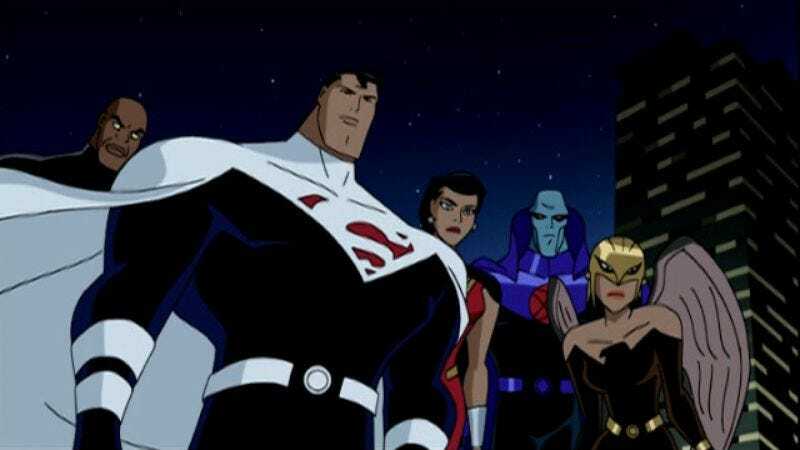 The regular DCAU Justice League doesn’t appear until halfway through the first part of “A Better World,” with the first 10 minutes of the episode dedicated to the exploits of the Justice Lords. It begins with Superman, Wonder Woman, and Batman invading the White House to take down a scheming President Luthor, who tries to explain that Superman needs him because he can’t be a hero without an enemy. Luthor thinks that Superman secretly loves the attention and praise, but his patronizing goes a step too far and forces Superman to make a lethal decision. “Do you smell something?” Batman asks, and when he and Wonder Woman reach the Oval Office, they find the President of the United States burnt to a crisp by an unaffected Kal-El. “Are you okay?” Wonder Woman asks. “I’m great,” Superman replies as the camera zooms out to conclude the cold open with an ominous shot of the White House. Little kids must have gone crazy when this episode first aired, and writer Stan Berkowitz dives right into the world of the Justice Lords without setting it up as an alternate dimension. After the opening scene, the story jumps forward two years, revealing a fully staffed Watchtower that looks a lot like the JLU version of the team’s space base. All the heroes have new costumes: Superman’s new suit incorporates the white of his Batman Beyond look, a short-haired Wonder Woman is in a Donna Troy-esque red body suit, Green Lantern has his JLU shaved head, and J’onn has retired the red X-harness look for a more traditional superhero appearance. On the Watchtower, Lord Superman is discussing the postponement of elections with someone who looks and sounds a lot like George W. Bush; as in the past two episodes, there are a lot of connections between this show and real-world politics. The police forcefully terminate a student protest in a moment that recalls campus unrest during Vietnam, and the Justice Lords’ infiltration of the regular DCAU gains added significance considering the United States decided to invade Iraq the spring before “A Better World” premièred. That second parallel turned out to be a coincidence, but there’s no denying that this episode has a political bent, especially when there’s a scene involving Superman righting a fallen American flag. When Lord Batman discovers another dimension similar to his own—but where the Flash is still alive—the Justice Lords decide to remake the main DCAU in their own image. To do this, they need the Justice League out of the way, so Lord J’onn walks through the portal and asks the League for their help in fixing a rift between dimensions. They decide to assist him—but when they follow him through the portal, find themselves trapped in a white box that fries them into submission. Their imprisonment is perfectly timed with the crash landing of Doomsday, the monster who, in the comic books, killed Superman. The death of the Flash is part of the motivation for the Justice Lords’ behavior, a decision made by the writing team because Wally’s attitude doesn’t fit with this version of the team. It could also be a nod to Crisis On Infinite Earths, the event comic that killed off Flash Barry Allen as it reorganized the DC universe and adjusted DC continuity. The post-Crisis DCU was a much darker place than the one that came before, its heroes now reflecting a tone established by grim-and-gritty comics like The Dark Knight Returns and Watchmen. These seismic shifts at DC Comics tend to require the sacrifice of a Flash, and for the New 52, Wally West was wiped from continuity to allow for the return of Barry Allen. Characters from The Authority are actually now a part of the mainstream DC universe (albeit severely neutered), and a new Justice League Of America series was just announced this weekend, featuring a very Justice Lord-looking J’onn J’onzz on a team that includes Catwoman, Hawkman, Stargirl, the new Green Lantern Baz, and Vibe (huh?). This team will apparently be clashing with the other Justice League in the upcoming “Trinity War,” which, unlike “A Better World,” will be a story stretched out over a year and multiple titles. In the Justice Lords’ universe, Flash manages to outsmart Lord Batman and frees his teammates, going with Superman, Wonder Woman, J’onn, and Green Lantern to rescue a wounded Hawkgirl from Arkham Asylum while Batman confronts his alternate self. The Arkham scene is a great bit of comic relief in the middle of a tense episode, featuring the Joker as an orderly who walks the League through the quiet, salmon-colored asylum, complete with soft jazz on the intercom. All the inmates have two little burn marks on their foreheads where Lord Superman lobotomized them, and in a great visual gag, the puppet Scarface has been cooked—but not the Ventriloquist. The League fails Joker’s password quiz, and are forced to fight an army of Superman robots while Batman tries to find out more about the Justice Lords. There’s the slightest modulation in Kevin Conroy’s voice for Lord Batman that sounds slightly more like Bruce Wayne than the usual Batman voice, and it seems like Lord Batman is certainly less tortured. “We’ve made a world where no 8-year-old boy will ever lose his parents because of some punk with a gun,” Lord Batman says, and these are the words that stop the fight and bring the two men together. It’s all part of League Batman’s plan, though, and he ultimately bring his adversary over to his side when he points out that Thomas and Martha Wayne would be ashamed of the world their son has created. 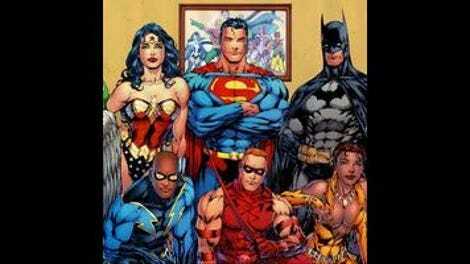 With Hawkgirl saved by a lovestruck Green Lantern, the Leaguers flee Arkham but are intercepted by the police. Lord Batman arrives to save them, and sends the Justice League through the dimensional transporter to take out their evil selves and repair the damage to their reputations. Superman realizes that to defeat the Justice Lords they will need to cross some kind of line, and he seeks out an unlikely ally as the rest of the team pummels the Lords. There’s some wonderful direction in this sequence, including a Martian serpent fight between the two J’onns and a hard-hitting nod to the old Wonder Woman TV show when Diana throws her tiara to save Batman. Superman teams up with Lex Luthor and his deus ex machina power-disruptor gun to take down Lord Superman and the rest of the impostors, but at the price of a full pardon for all of Lex’s past injustices. It’s a decision that is going to have some major consequences for the team, but it’s still better than the alternative. One of this episode’s biggest successes is in showing that Superman can be imperfect. He doesn’t have all the answers; he does what he can and hopes that things work out in the end. Events don’t work out in Superman’s favor this time, and the episode ends with Luthor announcing his entrance into politics, closing with a nice sense of symmetry after a story that was all about reflections. Superman and Wonder Woman are going to be the new DC “power couple.” If it’s not in Brian Azzarello’s Wonder Woman, I’m just going to pretend it’s not happening. That giant shockwave when Superman and Doomsday’s punches collide is fantastic. I love seeing how the directors become better at capturing the scale of these fights. There are so many Superman decapitations in this episode. Guard: “They gave us their word.” Lois “Sucker.” Dana Delany is the quintessential Lois Lane for me.